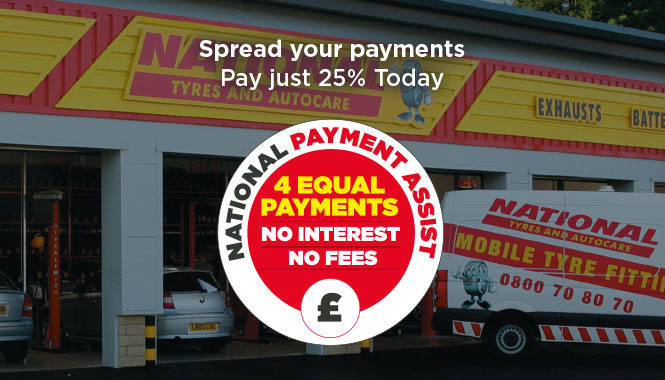 Spend between £250 - £1,000 on selected products or services at National Tyres and Autocare, pay just 33% now and spread the balance equally over the following 2 months with interest free payments and no fees. There are no credit checks or lengthy forms to be completed, so as long as you have a UK-registered debit card with sufficient funds to cover the 33% initial deposit, you can take advantage of the scheme. Payment Assist is currently available on the following tyre brands: Avon, Dunlop, Pirelli, Bridgestone and Sailun and on any other products of services between £250 - £1,000. You pay a third of the bill on your debit card. Two further equal payments will be taken monthly from your debit card. For more information, please speak to your local branch manager. Payment Assist is the number one service provider of retail finance in the automotive aftermarket. As a responsible lender, Payment Assist Ltd complies fully with the requirements of the Financial Conduct Authority FRN 622544 and the Data Protection Act: A8041970. Any personal information supplied will not be shared with third parties.